Dolphins have evolved over millions of years, adapting perfectly to life in the ocean. They are intelligent, social and self-aware, exhibiting evidence of a highly developed emotional sense. Dolphins simply don’t cope in captivity and this report again reconfirms why Indonesia should take immediate action against the ongoing exploitation of dolphins. One of the absolute requirements by the public for maintenance of ‘Wildlife in Captivity’ is that their welfare should be assured, Something which unfortunately is impossible for captive marine mammals. Another requirement should be that there are educational and scientific benefits for keeping the animals captive. The educational benefits from exposing captive marine mammals to the public are yet to be demonstrated as there is nothing natural about keeping marine mammals in captivity, therefore the educational aspect is zero. Indonesia lacks any enforcement capability for to these standards. It is concluded that Indonesia should put a moratorium on the captive dolphin trade. Here are just a few of the issues with captivity in general .. Captures of dolphins are traumatic and stressful and can result in injury and death of dolphins. The numbers of dolphins that die during capture operations or shortly thereafter are never revealed in Dolphinariums or ‘Swim with Dolphins Programs’. Some facilities even claim their dolphins were ‘rescued’ from the ocean and cannot be released. This claim is almost, every time, invariably false. Training of dolphins is often deliberately misrepresented by the captive dolphin industry to make it look as if dolphins perform because they like it. This isn’t the case. They are performing because they have been deprived of food. Most captive dolphins are confined in minuscule tanks containing chemically treated artificial seawater. Dolphins in a tank are severely restricted in using their highly developed sonar, which is one of the most damaging aspects of captivity. It is much like forcing a person to live in a hall of mirrors for the rest of their life – their image always bouncing back with no clear direction in sight. Dolphins and whales have been shown by recent scientific research to be sensitive with likely more ranges of emotions than humans, with culture that is handed down through generations, and personal names. They deserve our respect and the right to remain in the wild, free from harassment and harm. The only ones gaining from keeping them captive are businessmen for their personal interest. Keeping dolphins captive has proven to have no educational value and is a huge attack to their welfare and on wild populations. Indonesia has a very big and serious problem with dolphin trade, which seems to be neglected by the authorities, Yet has a big impact on the Indonesian biodiversity and on Indonesia’s reputation as well. Jakarta Animal Aid has done extensive surveys on the status of dolphins kept in captivity around Indonesia. We have monitored conditions at Ancol in North Jakarta, and in Central Java at a travelling circus and at various hotels around Indonesia that keep dolphins in small hotel swimming pools. In every case, the dolphins suffer a slow death from being kept in unnatural habitats. In 2010 a Memorandum of Understanding (MOU) was signed between the Jakarta Animal Aid Network and the Indonesian national Forestry Department to rescue, rehabilitate and release tens of illegally kept captive dolphins from private businesses in Java and Bali. This MOU was undersigned after a request by the Indonesian National Forestry Department to tackle the problems with the trade in dolphins. Yet only two months after undersigning the MOU, the director Bpk Harry Santoso was exchanged with a new director, Bambang Novianto, who was not supportive of the program, yet supported the businesses like Taman Safari and Wersut Seguni Indonesia keeping the dolphins and catching more dolphins instead. All facilities constructed and the big investments made also by foreign donors were ignored by the new Forestry Department director and remain unused until today. These facilities have been constructed in Karimun Jawa after our research proved that all dolphins held captive were captured in that region, despite the status of being a National Park. The conditions at every single facility we researched are extremely poor. The water in the small tanks are over-chlorinated to make tourists believe the dolphins are in clear blue water. Laboratory research (2012) proved that the water contains eight times as much chlorine levels as officially tolerated by mammals. Over chlorination causes blindness, skin disorders and general decline in health. Conditions in dirty water (usually full of faeces) cause infection and slow death in the dolphins. All captive dolphins, unable to swim long distances, suffer great stress as they normally travel many miles every day when living in the open ocean. Their restricted movement and isolation from a pod causes such stress that their health rapidly deteriorates. We saw dolphins kept alone or with only one other dolphin, which is completely unnatural as they thrive in groups and are an extremely social animal. The American Scientific Authority has released a report in February 2012 in which was stated that dolphins should be provided ‘human rights’ for their high intelligence and social behaviour. Dolphins kept by the travelling circuses are subjected to frequent moves in tiny containers of water. They spend many hours riding over bumpy roads moving from one village to another. Dolphins die during transport and circus owner Deny Karso just replaces them with new wild-caught dolphins, using loopholes in the law on biodiversity number 5 1990 in which an exemption is made for anyone keeping dolphins captive if for the reason of ‘research’ or rescue’. The commercial institutions in Indonesia continue to use this reason ‘Rescue’ to keep the dolphins captive. It’s easy to mislead the authorities in whether the dolphins were actually captured or indeed ‘rescued’ after they got entangled in fishermen’s nettings. As it is very unlikely for dolphins to become entangled in fishermen’s nettings this reason doesn’t make any sense yet the forestry department keep allowing commercial institutions like Ancol and Melka Hotel and regular fisherman to capture Dolphins for the horrendous ‘Dolphin Traveling Circus’ to keep dolphins after they were reported as ‘rescued’. To know more about the Worlds last Dolphin Traveling Show/Cicrus and what JAAN has done to try and stop this, Click here. Almost seventy dolphins remain captive, die and are being replaced with wild caught dolphins continuously under the authorization of the forestry department especially the central Java Forestry Department (BKSDA Jateng) and the Bali Forestry Department (BKSDA Bali) offices. Since 2009 JAAN has been pro-active within dolphin protection, due to the many problems occurring with the live, illegal trade in dolphins in Indonesia. Throughout 2009 JAAN received complaints from the public about a dolphin travelling show, as during the show in Bekasi in July 2009 a dolphin died which shocked the public. This circus was operated by PT WSI, which at that time did not yet have the legal permits needed to keep protected wildlife legally (‘Lembaga Konservasi’ permit , which is provided by the forestry department and was later provided to WSI despite the poor conditions at the center for the animals kept there and the illegal activites conducted by this company). After a first meeting with the head of forestry department in Central Java, Bpk Minto Basuki and his staff in early 2010 it was agreed that a collaboration was highly needed to rehabilitate the ‘surplus dolphins’ that were obtained from the Java sea. These dolphins all were provided a ‘Surat Titipan Sementara’ ‘Temporary holding permits’ by the forestry department since the centers receiving them stated that the dolphins had been ‘rescued from fisherman’s nettings’. JAAN sent a team to interview the local fishermen in Batang later in the year who openly stated that the commercial centers WSI and TSI were requesting dolphins and paid 4 million Rupiah (Around US $380) per dolphin. If a dolphin would arrive in poor or dead condition the fishermen would still be provided gasoline money. Clearly the commercial centers use loops in the present laws protecting dolphins to enable them to obtain dolphins from the wild. The fishermen stated they had to bring the dolphins ashore in the night-time to avoid any interference by the authorities and they realized this was illegal. A Fisherman named Maskon also stated that normally they would never capture dolphins and sometimes he felt sorry for dolphins he had captured due the sounds they make afterwards ‘The dolphins cry, like crying babies, very human like’ he said. Shortly after the first meeting, Bpk Minto Basuki send out a letter to all commercial dolphin centers in the area (TSI and WSI, both involved in the same business and in the same province; this because this is where dolphins are captured; from Karimun Jawa area) to warn them that they could no longer receive dolphins from the Java Sea, because clearly the statement that these ‘dolphins get entangled in fishermens nettings and are wounded and therefore need to be brought ashore’ is a lie to enable the commercial centers to continue capturing live dolphins and use them for commercial practices. These centers run travel shows; a practice which is very cruel and stressfull for the dolphins involved and therefore the centers continously need new live dolphins as death occur fast with the dolphins exploited in this business. 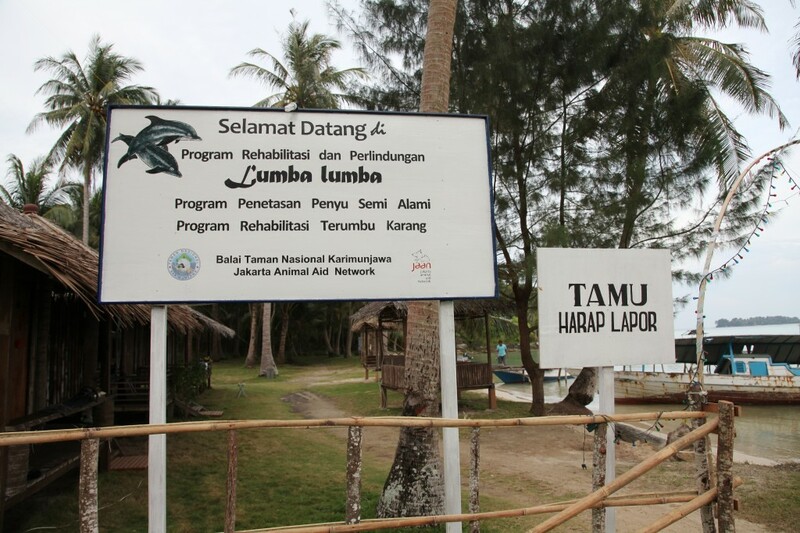 With the support of Ric O’Barry’s Dolphin Project, JAAN was able to construct the permanent rehabilitation center for dolphins in Karimun Jawa area. After various meetings between JAAN,The Central Forestry Department and Ric O’Barry’s Dolphin Project, an MOU was undersigned to enable effective collaboration to halt the illegal trade in dolphins and rehabilitate captive dolphins with the temporary holding permits. JAAN started with an awareness campaign in Karimun Jawa area and Pantai Pantura about the importance to protect dolphins and constructed the permanent and world’s largest seapen for dolphins. Until today, the sea pen in Karimun Jawa which could have rehabilitated tens of illegally kept individuals back in to the wild, remains empty. As the Dolphins have NEVER been confiscated. The circus continues their illegal captures from the Java Sea. The threats from the commercial centers to the JAAN team to pressure us to stop exposing them included posters with the face of JAAN Team members, Phone calls to the JAAN team member handphones and even threatening phone calls to family of JAAN team members started to occur frequentely. 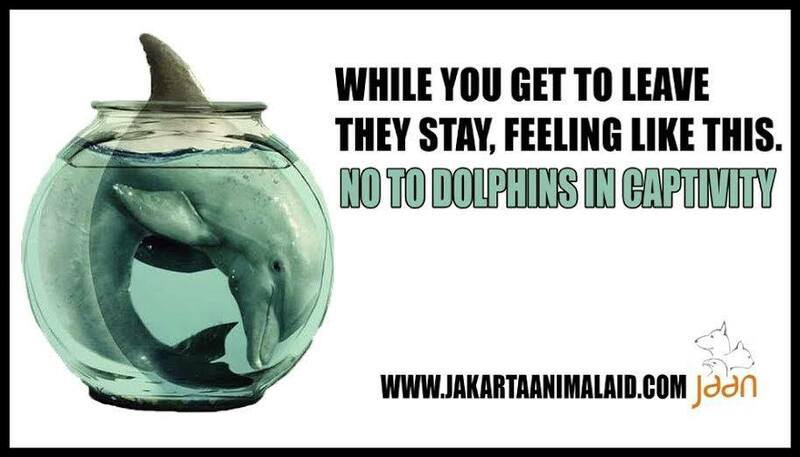 Even Indonesian public figures supporting JAAN and care about dolphins have received ‘unfriendly’ phonecalls. This clearly shows that these people are involved in illegal practices and are willing to use violence to people as they already do to dolphins. 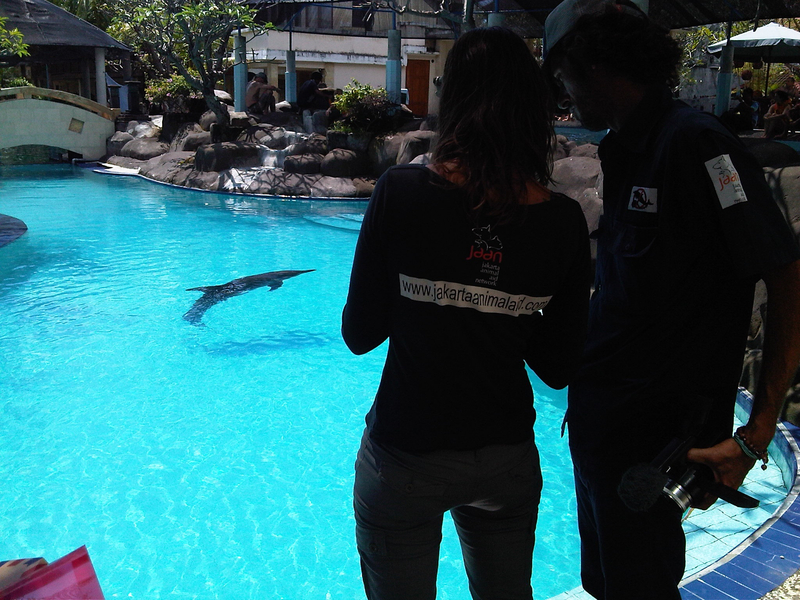 At the TSI Center in Batang, 2 Stenella Dolphins were kept in a very small pool. The Forestry Department BKSDA Jateng requested JAAN to come and see if these dolphins were releasable. JAAN and The Dolphin Project’s marine mammal specialist Richard O’Barry went to check the dolphins together with the team of the central java forerstry department in February 2011. These dolphins were supposed to be rehabilitated asap in the sea pen. This survey was made on request by forestry department. Since March 2011, after the seapen was finished and the first awareness campaign was completed, JAAN has not received any more response from the Forestry Department for the continuation of this very important program and has not recevied any update on the condition of the Stenella Dolphins that were supposed to be released. The head of the Central Java forestry department office (BKSDA Jateng) was changed in May 2012. The farewell party of this man was paid for and organized by the WSI Dolphin Travel Circus owner, Denny Karso. So now, New freshly wild captured dolphins were again handed over to the commercial center. After the central Java Forestry Department had officially announced that this is no longer acceptable and that all wild caught dolphins should be rehabilitated in the Rehabilitation Center in Karimun Jawa. This process is clearly showing that wild caught dolphins are STILL being captured from the Java Sea and that the Forestry Department is even collaborating without realizing it in this process! Proof that had been obtained by the JAAN Team was an Official letter from the Forestry Department (receiving the wild caught dolphins), to the fisherman regarding the catching of wild Dolphins. We strongly oppose to keeping marine mammals in captivity. In Indonesia, the exploitation of dolphins is still rampant, leaded by Taman Safari Indonesia and Wersut Seguni Indonesia. Owner of Taman Safari Indonesia, Tony Sumampau also owns a dolphin travelling show, which is managed by his son, John Sumampau. John also has been actively involved with captures of wild dolphins. JAAN has documentation (both video and written in email) as proof of this illegal activity. Anyone who wishes to capture dolphins should obtain a permit from both Indonesia’s scientific authorities and the Forestry Department but John Sumampau and also Denny Karso instead capture straight from the wild after which the dolphins are reported to the government as ‘rescued and in need of veterinary care and treatment’. In July 2014, four wildcaught dolphins were transferred to a restaurant in Keramas, Bali, where the dolphins will be used for ‘Swim with Dolphins Program’. $75.00 for 20 minutes is pure business disguised under the name of conservation. These 4 dolphins travelled by truck for more then 30 hours from Semarang. International regulations don’t allow transports by land to happen for more then 6 hours and under very special conditions only. This shows the unethical way dolphins continue to be treated in Indonesia pure for business but legalized by the Forestry Department. Worldwide businesses that keep captive dolphins are being banned. To name a few countries where dolphins are not allowed to be held captive anymore: India, UK, Costa Rica, Hawaii and a ban for Europe is being pursued now. After reading abit about the history between Jakarta Animal Aid Network and the captive Dolphins in Indonesia. Here is the Readaptation Centre built together with Ric O’Barry from ‘Dolphin Project’. 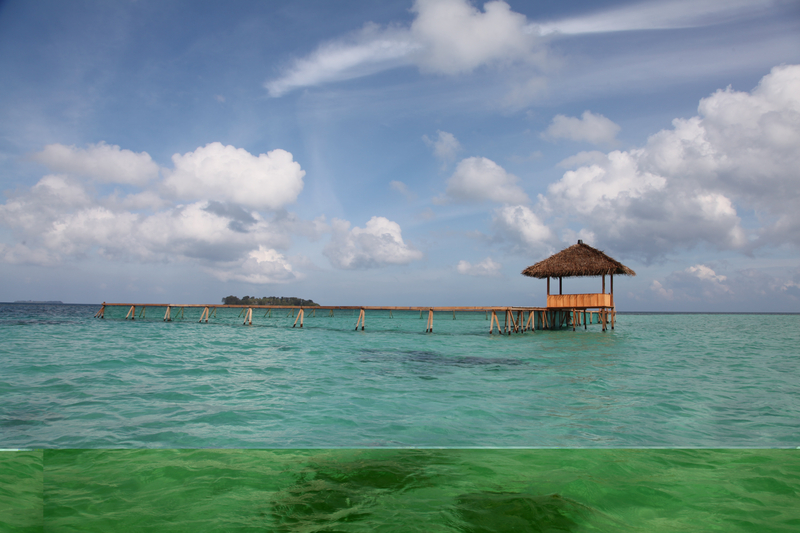 It is a Dolphin Rehabilitation Facility in Karimun Jawa, One of Indonesia’s famous islands. These facilities were built at the end of 2010 – beginning 2011 after the Indonesian Forestry Department reached out for help to rehabilitate the captive Dolphins held on ‘Temporary Holding Permits’. Again until now the Department of Forestry hasn’t ever contacted JAAN again regarding the rescuing of captive dolphins. We just hope that one day they will be actually used to help Dolphins! To know more about The Readaptation Centre and Ric O’Barry’s Dolphin Project be sure to visit this link to their website! A section of the Rehabilitation Facility. One of JAAN Founders, Femke and Lincoln O’Barry (Also from ‘Dolphin Project’) check the dolphins held captive in Melka Hotel, Bali. Jakarta Animal Aid Network and Ric O’Barry from Dolphin Project collaborate to build a Dolphin Readaptation Centre. 2. A huge impact on wild populations of dolphins as families are torn apart during capture and dolphins die early in captivity. 3. Illegal wildlife traders are now making big money while the authorities turn a blind eye. This should be stopped and sentenced according to the Indonesian Law on Biodiversity Number 5, 1990. The fact that all dolphins held captive were captured illegally by using loops in the law and the commercial institutions using the lie of ‘rescue’ to allow them to keep dolphins captive, shows how unwilling the forestry department is in ending this rampant illegal trade in dolphins. 4. The permits provided by the regional forestry department offices (BKSDA) to the businesses exploiting dolphins are ‘Temporary Holding Permits’. Yet these permits don’t seem temporary as never has any of such dolphins been released back in to the wild, after years, despite facilities available for the rehabilitation of these dolphins as built by the Jakarta Animal Aid Network in collaboration with the authorities of Karimun Jawa National Park and supported by the Ric O’Barry’s Dolphin Project remain empty and unused. The MOU signed in 2010 to rehabilitate all the dolphins with this ‘Temporary Holding Permit’ has never been followed through by the Forestry department yet JAAN has fulfilled all responsibilities written within this MOU to rehabilitate and release captive dolphins. 5. Dolphins held captive in Indonesia are kept under extreme poor conditions, shocking marine mammal experts from around the world. 6. Dolphins never cope well in captivity, but the extreme conditions dolphins in Indonesia are kept in are shocking the world. Pools with poor depth of 1.5 meters, green water filled with algae (Taman Safari), chlorine levels reaching 8 times higher then accepted standards (WSI) are just a few examples our team has observed in the field. The IUCN has written a clear letter in 2012 to halt the ongoing exploitation happening in Indonesia and uphold the MOU made with JAAN to rehabilitate all the captive dolphins. The fact that two imported Beluga whales died within 3 months after arrival in Ancol (2011) shows us that marine mammals are best to be left in the wild. The report made by IPB shortly after the death of the Beluga Whales clearly stated that stress was the main factor of their death. The Indonesian media kept exposing a birth of a dolphin in captivity (Ancol – 2010 & 2013 also WSI 2014) as a fantastic happening yet they didn’t realize that these dolphins were in fact wild caught while pregnant and gave birth too early due to stress while in captivity and that the babies always died within weeks to months after giving birth. Those important facts are kept silent. 7. To allow a few companies effect wild dolphin populations and the welfare of marine mammals so badly is unacceptable. Instead, attention should be put to protect dolphins and support wild dolphin watching programs run by local communities like in Lovina (Bali) and Kiluan (Lampung). This activity allows dolphins to remain in the wild and provides an income for local communities. Examples worldwide are available showing that this works extremely well and that ‘Dolphin Watch Programs’ can economically support whole fishing communities and provide a great alternative for fishermen to gain an income. A great example is the ‘Azores’ islands (Portugal) where whole villages rely on tourism for ‘Dolphin Watching Programs’. 8. The use of dolphins for ‘Treatment of Children with Autism’ is a scam and nothing more then a big business for the company offering this service. The reports of Professor Lori Morino prove this. 9. The ongoing captures of dolphins in Indonesia for the commercial exploitation has been too long ignored by the government and action is needed to stop these crimes. During January and February 2014 alone Melka Hotel has captured 3 Bottlenose Dolphins, all three of them died within premises only days after capture. 10. The Forestry Department has failed to protect marine mammals from exploitation. Instead, The Regional Forestry offices especially seem to gain benefit by allowing the commercial institutions to continuously exploit dolphins for profit. Despite the clear instruction by the Forestry Minister to halt the travel show in July 2013, the show continued to perform with dolphins and other protected animals during 2014 in Sidoardjo, Surabaya, Magelang, Cijanjur and Tangerang. In July 2014 four wild caught dolphins were relocated by Wersut Seguni Indonesia by truck from central java to restaurant ‘Wake’ in Keramas, Bali where the dolphins are now abused with commercial ‘Swim with Dolphins’ operator. For these reasons we are convinced that Marine mammals are best to be protected under the fisheries department, which is standard in all other countries worldwide. 11. Besides the fact that the ongoing exploitation of dolphins in Indonesia violates the Law on biodiversity No. 5 1990 (tentang konservasi dan keanekaragaman hati), PP No.7 Tahun 1999 (tentang jenis-jenis satwa dan tumbuhan yang di lindungi). It also seriously violates the Animal Welfare Law KUHP 302 and the order made by the Minister of Forestry UU (Dirjen PHKA Nomer S.384/IV-Set/2013 dated 15 agustus 2013 / Travel dolphin circus). With the exploitation of dolphins, even the 5 basic freedoms on Animal Welfare are seriously violated as captive dolphins are never free of hunger, they always suffer pain (during trainings and also due to the sonar bouncing back on the walls). They have no ability to show any natural behaviour and are always in distress. 12. The Majelis Utama Indonesia has declared any form of wildlife exploitation to be ‘haram’. Therefore this abuse of dolphins clearly is seen as ‘haram’ and should be ended. 13. For the construction of world’s largest and only permanent rehabilitation center for dolphins a large investment has been made by Ric O’Barry’s Dolphin Project and Jakarta Animal Aid Network. We call upon the authorities to finally put this center to good use. The Bupati from Jepara has opened the center in 2011 together with the head of the National park, Bpk Nababan yet the center remains unused until today. Indonesia should start to protect the dolphins by no longer allowing any exploitation of dolphins for amusement and profit, instead support local fishermen to obtain an income by constructing and improving an eco tourism industry such as ‘Dolphin watching programs’.